I. Thou shall not share text only based posts. II. Thou shall only post content that your audience will like. III. Thou shall use third party publishing tools to save time in scheduling. 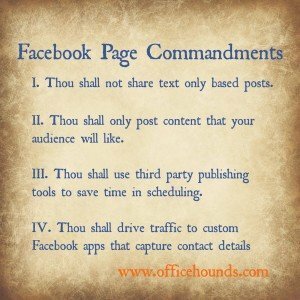 Why follow the Facebook Page Commandments? Over the years, Facebook have made changes to pages that many business owners and marketers have struggled to keep up with. 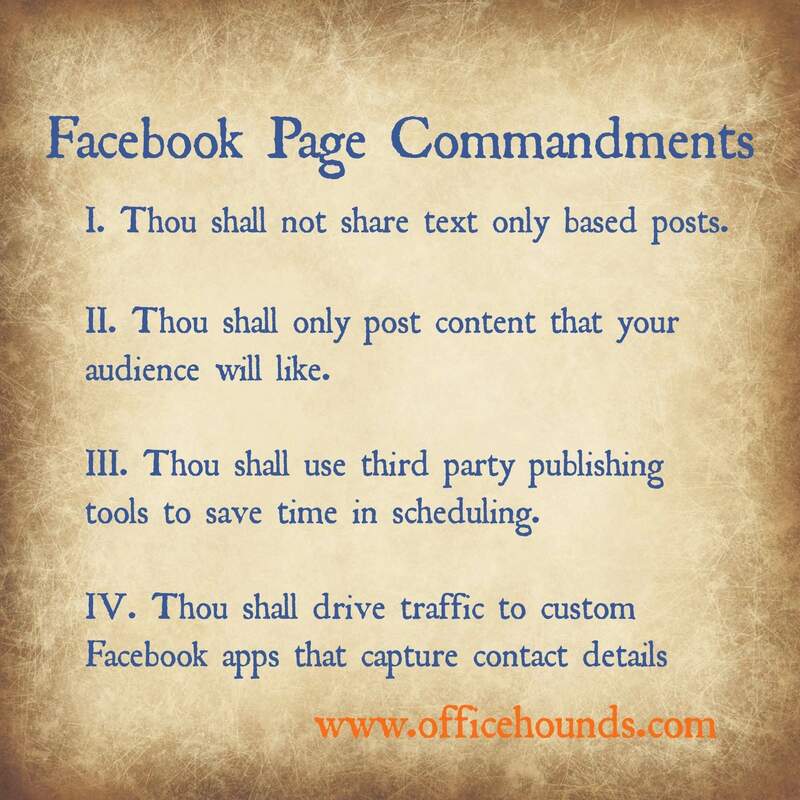 At OfficeHounds, these are the commandments we follow for our customers and the reasons why. According to Facebook News (Aug 2013), “every time someone visits News Feed there are on average 1,5001 potential stories from friends, people they follow and Pages for them to see, and most people don’t have enough time to see them all.” They go on to explain that there are too many posts to be displayed in chronological order, so they have an algorithm that tries to predict what people want to see from trends in user behaviour. People are less likely to like or comment on text based status updates from pages, but people will engage with status updates from friends. Page posts with eye-catching images or links to blogs or interesting content are more likely to be seen in newsfeeds. Ok. We admit that the challenge for most page owners is knowing the minds of their audience. Not only do you need to understand the kind of comment that your audience will like, but you also need to understand specifically the type of content they like when they are on Facebook. The same person may be more likely to read retweet your blog post on Twitter but ignore the same post on Facebook and instead like and share images with a useful tip. The only way you can learn what your audience likes is to get your target audience to like your page (the easiest way is with Facebook ads) then test different types of content and measure the response. Do more of what works. Stop doing the stuff that doesn’t get results, even if it seemed a good idea when you were planning your content strategy. With Facebook, go for quality over quantity ever time. The best way to justify the time and energy spent on Facebook marketing is to make sure you are using your Facebook page to capture contact details. A ‘like’ is ok, but permission to add those who like your Facebook page to your email mailing list is supercalifragilisticexpialidocious. Having permission to email gives you the opportunity for you to market to them when they are in a different frame of mind, possibly one where they are more likely to buy or take your desired action. Most people only use Facebook to catch up with friends and family and be social. Add a custom app that goes near your like count and post links to it in your timeline and on other social platforms like Twitter to get more email subscribers.